The excitement continues this week, with Fort Fido's third new "Assessment Dog", Petey. 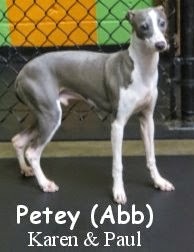 He is a eight month old, seventeen pound, blue and white colored, Italian Greyhound. Although small, Petey is a wiry and fast little fella, so much so, that his owners and I wanted to fit him in with the proper group right away. Based just on his size, he looks like he might head to the Little Roll, however, given his penchant for playing hard, and his lightning-speed, we knew that the Medium Roll would be more fitting for Petey. Fortunately we were right. After entering the play area tentatively, it wasn't long before Petey got quite comfortable... Meeting up with the rambunctious, Georgie, helped him find his groove quickly. The two canines begin to rip around the Roll right away, becoming playmates almost instantly. As more canines entered and the pack grew, Petey, continued to speak decent "Dog", and made quite a few more "friends". Petey definitely had a blast here today. Like dynamite, he is a lot of canine in a little package lol. We believe he will fit in and work well here. Welcome to The Fort Petey! Here, Petey and Georgie run amok! They continued to do that off and on for hours. Links to great dog articles!